ISAT and Kinetics flex connectors. There is NONE BETTER for Engineering services, manufacturing and testing capabilities - all backed by the industry’s most experienced staff. Prevent stresses due to expansion and contraction and compensate for misalignment. Absorb the continuing movement experienced in piping systems because of varying ambient temperatures, differences in temperature of materials being handled, and differences in composition. 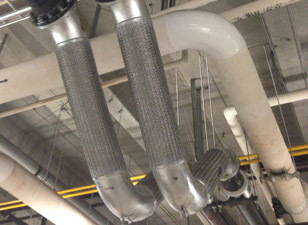 Reduce objectionable noise and vibration in piping systems, compressors, and other pulsating equipment. 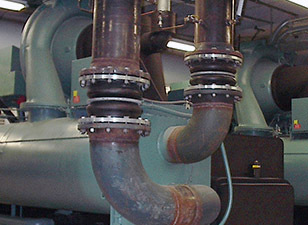 Flex connectors reduce objectionable noise and vibration in piping systems connected to pumps, compressors, and similar pulsating equipment. Seismic V-loops solve the problems of pipe motion caused by thermal pipe growth and the movements associated with seismic activity. Benefits of the seismic V-loops include limited amount of space required for installation and the ability to hold in heat compared to traditional large pipe loops. Another benefit is V-Loops do not introduce thrust loads on the piping systems whereas metal bellows and rubber expansion joints impose significant anchor loads due to the effects of static pressure thrust. The V-loop is a flexible product that does not expand when pressurized and can be manufactured with a variety of end fittings. 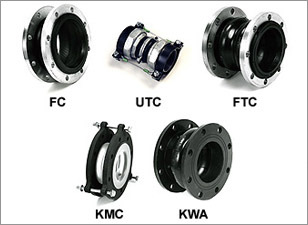 Flexible pipe connectors shall be used on all piping connected to rotating equipment to reduce the transmission of noise and vibration, and to eliminate stresses in piping systems due to misalignment and thermal movement of the piping. Flexible connectors shall be KINFLEX™ types UTC, FTC, FC, KWA, KMC, BFMC, or V-Loop.